Update your kitchen by adding this stylish yet durable Vigo faucet. Chrome finish with matching soap dispenser all solid brass construction for durability and longer life. Faucet features dual pull-out spray head for aerated flow or powerful spray. Includes a spray face that resists mineral buildup and is easy-to-clean. The BLANCO POSH collection features an urban, modern, European design. This kitchen faucet has a convenient pull-out sprayhead with dual spray function and a low profile design that works well for sink stations with limited overhead space. The POSH kitchen tap comes in a wide range of finish options designed to perfectly match BLANCO SILGRANIT. and Stainless Steel sinks. 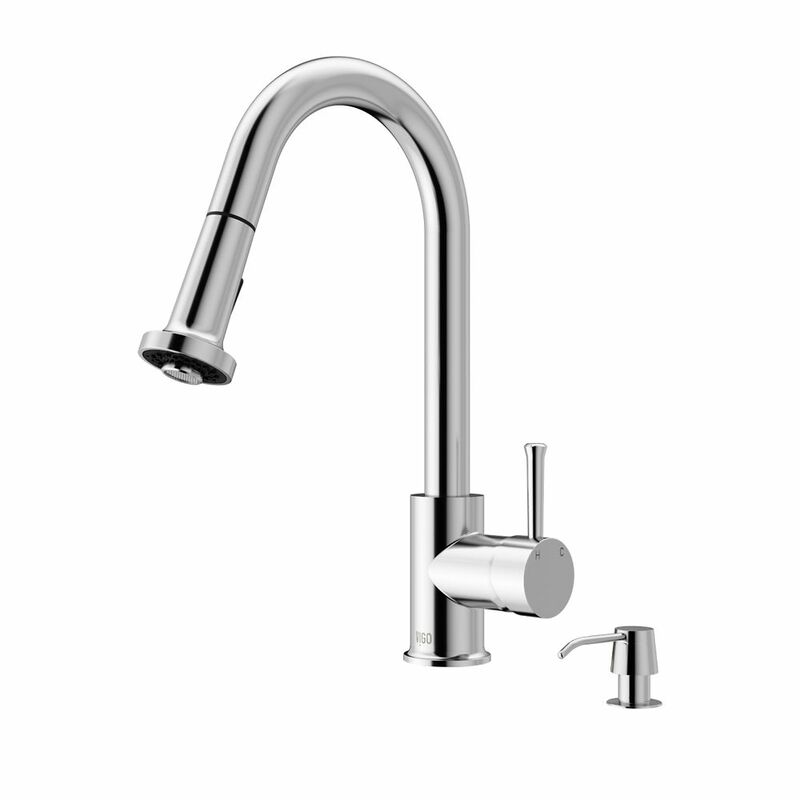 Chrome Pull-Out Spray Kitchen Faucet with Soap Dispenser Update your kitchen by adding this stylish yet durable Vigo faucet. Chrome finish with matching soap dispenser all solid brass construction for durability and longer life. Faucet features dual pull-out spray head for aerated flow or powerful spray. Includes a spray face that resists mineral buildup and is easy-to-clean. Chrome Pull-Out Spray Kitchen Faucet with Soap Dispenser is rated 4.5 out of 5 by 51. Rated 3 out of 5 by RDJB from Could be better... As many reviewers have mentioned, the spray head / faucet body connection is terrible. The spray head is hard to pull out and tough to put back together. Was hoping this would become easier with a bit of use but it doesn't seem to be the case. The good points of the faucet are the spray head itself (good ergonomics) with a nice spray feature and the water volume / temp handle lever is well designed. Rated 5 out of 5 by Milc from Perfect Looks great in my newly remodeled laundry room. Works perfectly and is easy to use. Rated 5 out of 5 by Bostman from Simply does what it is supposed to do!!! Bought this faucet at a Bargain Hunt store never hearing of the brand at all but it had quality looks so I decided to give it a try. It wasn't an easy install but this was basically due to my lack of knowledge and not the product. I operated great. So I definitely would recommend this faucet 100%!!! Rated 5 out of 5 by JeffG from Nice faucet! Easy to install and use. Much more water pressure than others. Allows the owner to determine flow rate by having an easy to remove limiting valve. Took mine out. Company is in the USA!!! Rated 5 out of 5 by sewartsymom from FINALLY I got my beautiful new faucet in place. ... FINALLY I got my beautiful new faucet in place. We were waiting for the counters to go in and now its in and I love it. The look is very modern and chic...and it works beautifully. Rated 4 out of 5 by Jdneer from Loved it up to this last month. Been great up to this last month and now the sprayer won't snap back into place and just hangs there now. It looks like a the piece that it snaps into has broken. What is my warranty replacement option? I bought this last year. Rated 4 out of 5 by CD61 from Good quality and value. Very pleased overall Installed sink and faucet about 3 months ago. Excellent quality. When the countertop installer picked up the sink, all he said was "heavy!" The sink definitely gets 5 stars. The faucet, more like 3. Like the design and overall function, but the detachable head takes quite some effort to lock and unlock before pulling out for use. Usually only detach it to spray down the sink at the end of the day. Overall though, very pleased with the product. Rated 5 out of 5 by tn29 from Improved redesign We initially purchased this faucet last year during a kitchen remodel. The faucet was difficult to pull down out of the shaft, it leaked, and eventually we were unable to switch between sprayer and stead stream. It was so easy to contact Vigo, and they have always been quick to send us replacement parts. They recently replaced the sprayer head for us, which solved all of our problems. They've completely redesigned this faucet head. It is no longer difficult to pull it down, it doesn't leak, and it is now super easy to switch between sprayer and steady stream. The mechanism to switch modes seems to be vastly improved and less apt to break. Overall, we are now VERY happy with this faucet, and I thank Vigo for making it right!